BlackBerry may be hoping for a recovery in its smartphone business, but it's hitting rock bottom right now. 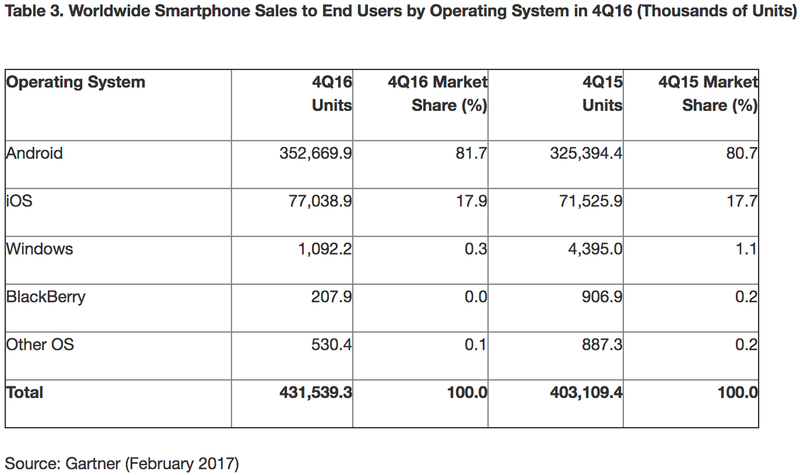 Gartner analysts estimate that BlackBerry's once-dominant platform hit 0.0 percent market share in the fourth quarter of 2016. Yes, zilch. The company did ship 207,000 phones, but that gives it less than half the unit volume of the "other OS" category. This wasn't hard to see coming given BlackBerry's years-long decline, gradual shift toward Android and recent focus on services. It's still incredibly symbolic, however, and shows that the company's deal with TCL effectively amounts to starting from scratch. Microsoft won't be cheering much, either. Windows' share of the mobile space fell from 1.1 percent near the end of 2015 to 0.3 percent last year, with just shy of 1.1 million phones shipped. While that was virtually expected given the dearth of Windows phones (HP's Elite X3 was the real standout last fall), it leaves the platform not far behind BlackBerry. 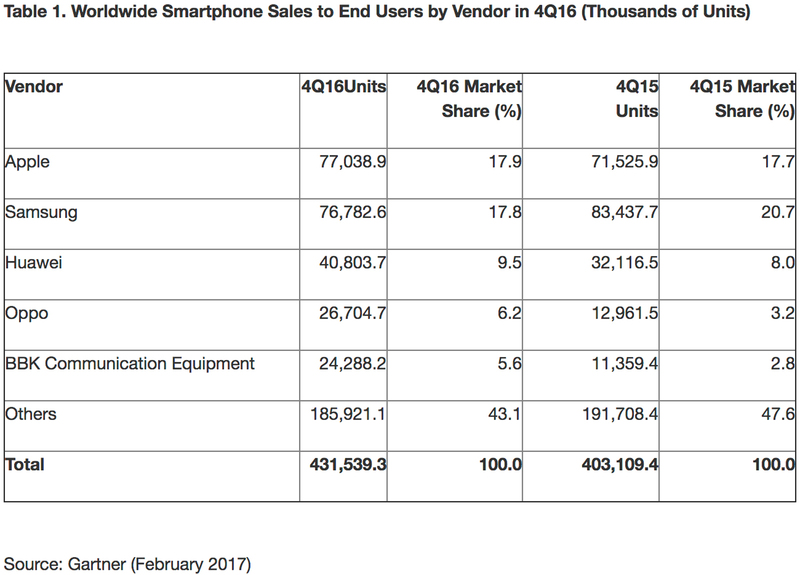 For all intents and purposes, this leaves the smartphone market down to just two platforms, Android (81.7 percent) and iOS (17.9 percent share). And it's rough even for some of those backing the winning horse. Samsung lost its lead among individual manufacturers after falling nearly 3 points to 17.8 percent. Gartner blames it on a combination of the Galaxy Note 7 fiasco and pressure from typically lower-priced Chinese rivals like Huawei and BBK. Apple didn't grow nearly as quickly as its Chinese counterparts, but its 17.9 percent share was enough to give it the lead. Simply put, the smartphone business is a vicious place to be -- even one misstep can cost a company dearly.